Paradise. Mmmm. I’m thinking beaches and palm trees, and someone bringing me cold drinks on the beach. I don’t immediately place gin there, but I could be convinced. This looks like a pretty sweet cocktail on the tin, but this is the same in all three books. That dash of lemon juice doesn’t look like it’s going to balance very much of the sugar. This is a really fruity drink, and not in a horrible way. It is indeed getting on the sweet side though, so I would actually bump the lemon juice up to a teaspoon. 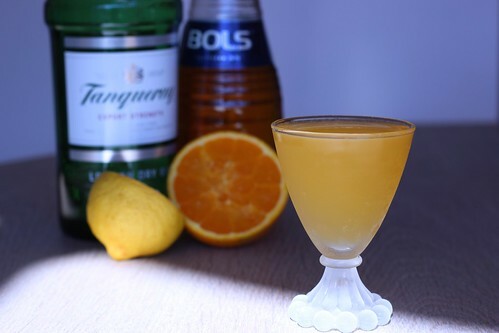 There’s nothing complex going on here, but I’m adding this one to my bar list as a nice simple, sweet, fruity option, since I can see it being easy and appealing for some of my regulars.